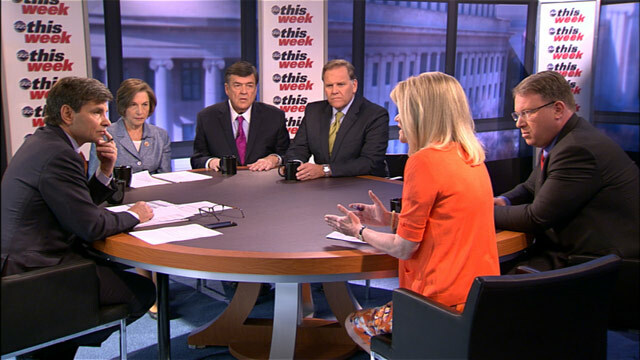 The 'This Week' roundtable discusses the latest news from Syria and the Boston bombing investigation. OBAMA: A red line for us is we start seeing chemical weapons moving around, or being utilized. STEPHANOPOULOS: Chemical weapons in Syria. MCCAIN: It's pretty obvious, that red line has been crossed. STEPHANOPOULOS: Does that mean military action is next? Plus, the Boston bombing investigation. (UNKNOWN): It is dangerous to the greater community and we have got to get to the bottom of this right now. BUSH: I appreciate my fellow members of the former president's club. CONAN: Everything you ate this evening was personally shot by Wayne LaPierre. OBAMA: We were willing to try anything, so we tried one of Michelle's tricks. (UNKNOWN): It's my favorite event of the year. STEPHANOPOULOS: We've got all the stars, jokes, and glamour from the White House Correspondent's Dinner. (UNKNOWN): This Week with George Stephanopoulos starts right now. ANNOUNCER: From ABC News, This Week with George Stephanopoulos. Reporting from the Newsmen in Washington, D.C., George Stephanopoulos. STEPHANOPOULOS: Hello again. They call it the Nerd Prom. That one night every year when politicians and the press pretend to be Hollywood starts, red carpet and all. And Hollywood turned out in more force than ever last night, all to hear the president take some shots at the press. OBAMA: I know CNN has taken some knocks lately, but the fact is I admire their commitment to cover all sides of the story. Just in case one of them happens to be accurate. OBAMA: I'm out in California. We're at a fundraiser having a nice time. I happen to mention that Kamala Harris is the best-looking attorney general in the country. OBAMA: As you might imagine, I got in trouble when I got back home. OBAMA: Who knew Eric Holder was so sensitive. STEPHANOPOULOS: Conan O'Brien shot right back. O'BRIEN: It's been several months since you were re-elected, Sir. So I'm curious, why are you still sending everyone five emails a day, asking for more money? You won! Do you have a gambling problem we don't know about? STEPHANOPOULOS: And, both men honored the Americans who rallied for others after the explosions in Boston, and Texas. OBAMA: We've had some difficult days, but even when the days seemed darkest, we have seen humanity shine at its brightest. We've seen first-responders, and National Guardsman who dashed into danger. And every day Americans who are opening their homes, and their hearts to perfect strangers. STEPHANOPOULOS: The dinner raised scholarship money for young journalists too. And we'll have much more from he evening ahead. But now we turn to the new questions about intelligence, and national security that's been building all week from Syria, to Boston, to Russia. And here to discuss the fallout are the Chairman of the House Intelligence Committee, Mike Rogers, Ranking Democrat Dutch Ruppersberger, fellow committee member, Jan Schakowsky, along with Jeffrey Goldberg of the Atlantic Magazine and our own Martha Raddatz. And Martha, let me begin with you. Let's talk about Syria, and -- and the admission this week from the administration that they discovered some evidence of chemical weapons use in Syria. Describe the evidence? RADDATZ: Well, I -- I think it sounds like pretty strong evidence. They've got hair samples, tissue samples from some of the victims. And there are at least 30 people who died in Aleppo alone, that they believe is directly traced to sarin. As they said, in varying degrees of confidence, they believe those deaths were -- were traced to he nerve agent sarin. What they don't have is the chain of custody. They believe the Assad regime is responsible for the deaths, but they don't know how yet to track that. STEPHANOPOULOS: So whey they say the evidence is not conclusive in their mind, that's why they want further investigations? Several weeks? RADDATZ: Which could be really hard to get if you don't really have people on the ground, and it dissipates quickly. So I think it could take even longer than that. ROGERS: It is. And there is also classified information that we have, that I think strengthens the case that in fact some small amount of chemical weapons have been used over the course of the last two years. And -- and the problem is, you know the president has laid down the line. He -- and it can't be a dotted line. It can't be anything other than a red line. And more than just Syria, Iran is paying attention to this. North Korea is paying attention to this. So I think the options aren't huge, but some action needs to be taken. And if you think about the destabilizing impact. Right now, the chemical weapons have been small in use. If you have a larger use, the refugee and humanitarian crisis that comes from that is huge. STEPHANOPOULOS: But let me ask the other question, how do you explain why it was such a small use of chemical weapons? Presumably President Assad knew that if he used chemical weapons it would -- it would trigger some kind of response. Why use it in such a small, small area. RUPPERSBERGER: Well the first thing, he could be testing. We're not sure. But whatever that is, it's -- it is a red line, and you don't kill people with chemical weapons. And it's not just about the United States and where we stand, it's at -- that the whole world and those countries around there. I think a key player here, is Russia. I think Russia can stand up and make a difference. And they have before in the last couple of -- within the last month, Russia I'm sure went -- went to Assad and said, look you don't cross this line. And -- and I -- and I think at this point we -- that's where we are. STEPHANOPOULOS: Well then let me ask, do you agree that the line has been crossed and it's conclusive? SCHAKOWSKY: Well the president, and I appreciate his deliberative approach to -- to this, you know we've had a little problem with going to the U.N. with the idea of weapons of mass destruction before. So we certainly want to finish the investigation. But he said, it's not an on and off switch, but it is -- it has changed his calculations. And of course, he's looking into all of the options. But, you know to -- to imply that maybe we're not doing enough, or we're not doing anything, I think also is a mistake. STEPHANOPOULOS: Well, Jeffrey Goldberg, let me bring this to you. Because you said -- you wrote a couple of pieces recently saying very clearly the red line has been crossed and the president must act. Unfortunately the president has doubled-down on this notion several times that if -- if Syria uses chemical weapons, he will take action. Kind of put himself in a box. GOLDBERG: Well, he -- he has, except -- and -- and I did write that, you know especially because of our experience with Iraq, this has to be excellent intelligence. The chairman says it already is excellent, accurate intelligence. But, it's fine for the president to demand extra -- extra levels of certification, if you will. But now he has, and -- and this is the problem of red lines. And, you know he hasn't put down a red line. He's been fuzzy on Iran, except to say that they shouldn't cross the nuclear threshold. But the Iranians are watching this one very carefully. They believe that he has a red line for their nuclear program, and they're watching how he handles the Syria issue. And every day that goes by where it seems as if there's indecision, or it seems as though there's some level of ambivalence, is -- is -- is the wrong signal to the Iranians, to the North Koreans, to anyone who wants to test the United States. STEPHANOPOULOS: But the question is, what are these options? I think the president has made it clear to us, well, he's not talking about sending troops. STEPHANOPOULOS: So what is this range of escalating options? RADDATZ: I -- I think you can talk about a no-fly zone, or a safe haven. None of that is easy. It sound great, a safe haven. But that involves taking out anti-aircraft. It involves kinetic action. And it involves a great deal of risk. And I think here, you have to remember the comparison with Iraq. President Bush was looking for ways to go into Iraq. President Obama does not want to go into Syria and is looking for ways not to go in there. So I think that's one of the reasons why they're being so cautious here. And military action, I think you know is the military always the option? What is the grander strategy here? Does it have to be a military option? STEPHANOPOULOS: These are the opposition to the Assad regime? ROGERS: ...well, what they have done is attach themselves to the secular units. That causes a huge problem for us. And here's the biggest problem, and why at least our leadership, and this is not about military intervention alone, how often is the Arab League actually asking us to show leadership with them, to help coordinate their resources on the ground in Syria? It doesn't happen very often. Why? The conventional weapons, if they get loose from Syria, and there are a bunch of them, is incredibly destabilizing to the Levant, to the Middle East, to Southern Europe. That's Israel is -- is concerned, Jordan is concerned, Turkey is concerned, because they see that in chaos, if -- when he falls, you have Hezbollah in the north trying to get their hands on both chemical and conventional weapons, you have al-Qaeda all over the country now, even knocking on Israel's doorstep in the south, also looking to get better equipped through these stockpiles. It is horribly destabilizing. That's why they need to take a leadership role. STEPHANOPOULOS: But it does appear, Congressman that the Assad regimen is, perhaps in many ways even stronger than Saddam Hussein's regime at the beginning of -- of the invasion. This a resilient leader who is not going anywhere fast. RUPPERSBERGER: Well, we hope he goes a lot faster than he is now. A lot of people are surprised he's lasted this long. I agree with Mike on the issue of the chemical weapons. That is severe. We have to know where they are, and we're very much concerned, if Assad eventually falls, where these chemical weapons are going to go. Just like in Libya. We had a lot of weapons that went to some bad guys. And it's the same situation here. So -- but we have to be together as a team. You know we can't make decisions because we're concerned about how -- how Iran, or North Korea looks at us -- at us. That is an issue, no question. But we're going to do what we need to do. We have unique weapons that no one else has. But you talk about a no-fly zone. It's easy to say it, but Syria is very sophisticated. Libya was not sophisticated. So, we have a lot of issues on the table, and we've got to get it right. But, I believe very strongly, we have to do it as a -- as a team. GOLDBERG: The most effective escalation for the Americans? GOLDBERG: A safe haven means essentially you're occupying part of another person's country. I mean, let's not kid ourselves. If you're going to say that this is a safe haven means that you're enforcing a no-fly zone over that haven, that means you have established your sovereignty in somebody else's country. That is not -- we can't call that invasion in the Iraq style, but that's a very serious thing. I think obviously the number one thing for Americans to do, and for the world community to do, is to make sure that these al Qaeda forces don't get hold of any Assad's chemical weapons. That's -- look, President Obama has said this, President Bush before him has said this, that the ultimate nightmare for the United States, and for our allies, is the marriage of weapons of mass destruction and al Qaeda. And in Syria, we're dangerously close to that happening as Syria falls apart and we're not aware of where these chemical weapons are. So we have to stop chemical weapons from being used. And we have to stop them from falling into even worse hands. RADDATZ: I think -- can I just say one thing on the pushing that line in the small number -- the small amount of sarin apparently used I think that's really pushing that line, that's really testing to see how far he will go. STEPHANOPOULOS: Assad, it's testing by Assad. RADDATZ: And I think the issue of the number of people who have been killed, which is fairly small, is an issue for the administration. We're talking about weapons of mass destruction. This wasn't mass destruction. So, I think that's a game Assad is playing that makes it more difficult for President Obama. STEPHANOPOULOS: And what he would be hoping, I presume congresswoman, is that he tries a few chemical weapons, America and the rest of the world does not respond and that demoralizes the opposition. How far would you go in supporting more military action? SCHAKOWSKY: Well, let me say that no country in the region wants boots on the ground. We had King Abdullah come to the United States. And what he was asking for was help with a political situation, which obviously would be the best. Russia is in a position to help pressure Assad. And I think that he has to go. I don't think there's any question about that. But, I think that all of these options have to be looked at, because the day after, the day after Assad is the day that these chemical weapons could be at risk, that if we don't address the growing sectarian that is there, and help the people who are more moderate, we could be in bigger, even bigger trouble the day after. STEPHANOPOULOS: I want to move on to another topic. But to sum this up, am I hearing that all of you believe that more asserting, including military action, has to be taken but far short of actually putting U.S. troops on the ground? GOLDBERG: Nobody is calling for boots on the ground, that needs to be very, very clear. And remember, when we're talking about safe haven, equipment with the Arab League goes a long way. That doesn't have to have a U.S. face on it. But what they do need is specialized equipment that can take planes and helicopters out of the air so you can train the Syrian forces that we can vet and train under the rule of law. STEPHANOPOULOS: Mr. Chairman, let me stick with you and move on to the issue of the fallout from the Boston Marathon bombings. Are we any closer, any closer, now close to a couple of weeks in, in figuring out this key central question, who radicalized these brothers and when? ROGERS: The older brother -- to violence. And there is a lot that we just don't know. And that's why many say, hey, the Russians need to step up to the plate here and provide us better information. STEPHANOPOULOS: Why wouldn't they have provided it? ROGERS: You have to remember the FSB is a hostile service to the FBI and the CIA. There's a cultural problem there between where the Russians are and our folks. So they sent a letter, didn't have a lot of information, and then three extra times after the investigation was closed, they said, hey, do you have any more. They wouldn't do it. STEPHANOPOULOS: One of things they have provided is these wiretaps of the brothers' mother, who she seems to have been a key figure at least in encouraging the older brother in his more fervent worship. SCHAKOWSKY: The FBI are listening to those tapes thought at the time, at least, that it had more to do with internal Russian politics and not so much a threat to the United States of America. But I don't really agree that we're not any closer, because this is one of the most broad investigations that we've seen. All of our law enforcement and intelligence community, doing a great job investigating and questioning all of the associations. Awlaki, the radical cleric, dead, but still have -- there's tapes. STEPHANOPOULOS: They're looking at his tapes, right. SCHAKOWSKY: They're looking at tapes. STEPHANOPOULOS: But when you say you're closer, I mean to pick up on what the congressman was saying, this idea that there might have been other persons of interest, do you know of any other people here in the United States who might have been a part of this process of radicalizing Tamerlan? RUPPERSBERGER: This is part of the investigation, this is a domestic investigation and it's an international investigation. And we're really god at this. The FBI is very good with that, working with our other agencies. There are persons of interest in the United States. We're looking at phone calls before and after the bombing, this type of investigation. But I agree with Mike, also, the real test about whether he was radicalized or not -- or where he was radicalized is Russia. And we have to do a lot of investigation in Russia, because when he went over to Russia and then came back, things changed, including his brother -- his younger brother. RADDATZ: But it seems like he was partly radicalized here, as well. I mean, this started in 2009 and 2010 when people started talking about a real change in the older brother then he went over to Russia. And clearly something more happened and meeting with extremists and those wiretaps. And you have got to wonder why they wiretapped the mother to begin with. GOLDBERG: But the tragic fact of the matter is you don't have to go to Russia to be radicalized, you don't have to go to Pakistan, or Afghanistan, you can do it right in your bed room on the internet. We've learned that. Osama bin Laden is dead. His work and his ideas are carried on. And we have a very deep problem no matter -- you know there are people who are being self radicalized at this moment in the United States of America. And we have to find a way to disrupt that radicalization process. And it's very difficult, because it's all there on the internet already. STEPHANOPOULOS: And I want to get to that, but one of the things we have seen, chairman, is that it wasn't enough for these guys to go to "Inspire," to go to the website to learn how to build the bomb. I know the FBI has real suspicions -- even with what they found on the internet, they had to have some kind of help to still get those bombs together? ROGERS: Yeah, absolutely. And not only that, but in the self-radicalization process, you still need outside affirmation. So in every case that we have seen, that has led to somebody taking an event to try to commit an act of violence, there was outside self -- or affirmation of their intent to commit an act of jihad. I believe that happened in the United States. Now we don't -- we still have persons of interest that we're working to find and identify and have conversations with. STEPHANOPOULOS: And you're saying 10 or fewer? ROGERS: I didn't say that. I didn't give a number. I do think there are persons of interest in Russia is where I think they went from, yes, I'm ready for jihad, here's how you conduct an act of violence with including training. RADDATZ: And the scary part there is who else is still out there that they also radicalized. RUPPERSBERGER: The threat to our country -- we though the lone wolf, and that's just not one person. STEPHANOPOULOS: But in this case, the FBI talked to him twice before he went to Russia. I guess the big question, and congresswoman let me bring this question to you, is why there were not further interviews after Tamerlan came back from Russia. If there was any breakdown in the system, that was it. SCHAKOWSKY: Well, I think we need to look at that. The older brother Tamerlan was on the databases, the TIDE database the TECS database. We had him information about them. Were the dots not all followed to lead to a more investigation? I think that's worth looking at. STEPHANOPOULOS: Do you blame the FBI for dropping the ball here? ROGERS: I think it's too early to start pointing fingers and blame. Remember, they're right in the middle of an investigation. I -- if you look at what they have -- did in 2011, at the end of the day they had no derogatory information including all of the databases -- all of the databases -- including interviews. And at some point, the FBI just doesn't get to investigate Americans or people here who are here legally just because they want to. That is a huge difference. Now what happened on the -- could they have done a secondary interview on the way back? There are some questions there if we can improve the system a little bit. However, I think it's wrong to blame the FBI in 2011. At the end of the day, they finished this investigation, found no derogatory. They did the digital footprint search, couldn't find anything. And then they asked the Russians, hey, will you help us, is there more to this that we missed, nothing. GOLDBERG: Far be it for a journalist to excuse the behavior of a government, but you know you have hundreds of thousands of people on these watch lists. And you don't have the law -- even if the law enforcement agencies have the constitutional power to investigate the way some people want, these suspicions, you don't have the personnel. You can't -- you can't watch 740,000 people, I think that's what's on the TIDE list. RADDATZ: And you're not really watching that area. STEPHANOPOULOS: Well, then I want to wrap this up by following up on the issue you raised just a minute ago, if the problem is self-radicalization here at home, it is relatively easy to do. What we do about it? GOLDMAN: Well, this is where the Muslim community has to come into play. You know, we've seen in a lot of cases where it's moderates in the Muslim community who have told law enforcement about radicals in their midst. And you know, you have this brightly-lit pathway on internet toward radicalization for a young, disaffected, alienated Muslim male. There has to be a counterpathway that -- you know, and this is not something that the United States can do. This is not something that a western power can do. This is an issue that's deeply embedded in the civilization struggle within Islam. And it's not something that the committee can fix. STEPHANOPOULOS: And another version of see something, say something. OK, thank you all very much. Fantastic discussion. STEPHANOPOULOS: Roundtable up next. And we're going to have the best jokes from the White House Correspondent's dinner. First, a look back at what happens when the commander in chief plays comedian. RONALD REAGAN, 40TH PRESIDENT OF THE UNITED STATES: I have been criticized for going over the heads of Congress, but what is the fuss, a lot of things go over their heads. BILL CLINTON, 42ND PRESIDENT OF THE UNITED STATES: And remember, if you really want a friend in this town, get yourself a dog. I wished somebody told me before I showed up with a neutered cat. GEORGE W. BUSH, 43RD PRESIDENT OF THE UNITED STATES: Here it comes, nuclear proliferation -- nucear proliberation. BARACK OBAMA, PRESIDENT OF THE UNITED STATES: Tonight, I want to speak from the heart, I'm going to speak off the cuff. Good evening. Pause for laughter. Wait a minute. JIMMY CARTER, 39TH PRESIDENT OF THE UNITED STATES: I'm filled with admiration for you and deep attitude for you for the deep contributions you have made to the most needy people on earth. CLINTON: I seriously considered calling you and asking you to do a portrait of me, those bathroom sketches were wonderful, but at my age, I think I should keep my suit. GEORGE H.W. BUSH, 41ST PRESIDENT OF THE UNITED STATES: We're glad to be here. God bless America and thank you very much. GEORGE W. BUSH: Good job. GEORGE H.W. BUSH: Too long? OBAMA: And what I know is true about President Bush, and I hope my successor will say about me, is that we love this country and we do our best. GEORGE W. BUSH: Whatever challenges come before us, I will always believe our nation's best days lie ahead. God bless. STEPHANOPOULOS: All of the living presidents joining opening of the Bush Library. He's given everyone a chance to reassess the Bush legacy this week. We're going to debate that in a little bit on our roundtable. Let me introduce everybody right now. Joined by George Will as always, Democratic strategist Donna Brazile, former House Speaker Newt Gingrich, the outgoing mayor of Los Angeles Antonio Villaraigosa and ABC's Matthew Dowd. And I do want to get to that in a little bit, George, but let me begin with what was happening all week long at the nation's airports. There are a long lines -- and as we learn the sequester had started to kick in, air traffic controllers started to be furloughed, created a debate on the floor of the House over how to fix it. REP. JOHN MICA, (R) FLORIDA: We're here because of a colossal failure of leadership and the ability to manage resources. PELOSI: How can we sit there and say four million Meals-on-Wheels for seniors, gone. But that's not important. STEPHANOPOULOS: George the president and Democrats insisted that there had to be a comprehensive solution to lift the sequester. But boy you saw Congress act in close to record speed. The furloughs hit at the beginning of the week. By Friday night a fix had been passed so the air traffic controllers could come back. GEORGE WILL, JOURNALIST: The comedian Lily Tomlin has a character, the bag lady. She says, no matter how cynical you get, you can't keep up. Look what happened this week. Two million Americans fly every day. So you can, in a very few days, you've got a real constituency of the irritated out there. But more important 535 members of Congress fly regularly. And this was going to inconvenience them, which was unthinkable. So the FAA having said this was all necessary because the sequester required it to live on the amount of money it had in 2010, now it was chaos to live on 2010 appropriations. Some whistleblowers within the FAA began sending out emails saying they were instructed that this had to be as painful as possible, on the theory, that if the government annoys Americans enough, Americans will say we should give the government more money. I don't follow the reasoning there. But the long and the short of this is George, the sequester is now going to be here for a very long time. Because they're going to find ways to make it administered more rationally. STEPHANOPOULOS: That means it will be a Swiss cheese sequester doesn't it Donna? DONNA BRAZILE, POLITICAL ANALYST: Absolutely George, but this sequester will have real impact on real people in real time. Not just members of Congress but people who work for the Park Service, medical research at the NIH began to make those cuts. It's impacted Meals-on-Wheels, kids who are in kindergarten. So I really do think the Congress needs to take a second look at this. Otherwise, every month we will be faced with another crisis. STEPHANOPOULOS: It seems like Mr. Speaker that the incentive is that it's been set up to have these rifle shot fixes going forward. That whenever something seems politically perilous, we'll go in and fix that one by one. NEWT GINGRICH, FORMER SPEAKER OF THE HOUSE: This was a real victory for fiscal conservatism. They didn't give the money back. What they said is, here's another pot of money that doesn't affect people nearly as much, we're going to cut exactly the same amount, but we're not going to do it stupidly. STEPHANOPOULOS: Doesn't that mean that the politically weakest are going to bear the biggest burden? GINGRICH: Not necessarily. It may mean that the most corrupt are going to bear the biggest burden. I mean the dumbest are going to bear the biggest burden. When you look at a $4 trillion government, you can find lots of really stupid things to quit paying for. STEPHANOPOULOS: So Mayor he calls it a victory for fiscal conservatism. ANTONIO VILLARAIGOSA, MAYOR, LOS ANGELES: I don't think so. I think it's a colossal failure in leadership like Mica said. It really is. We've had to balance budgets and deal with structural deficits in our city and in cities all across the country. We've done in a balanced way. You don't have to completely eviscerate services. You can make the efficiencies and find the savings that you need. And that's what the government needs to do here. I mean the problem with the Congress is they're both so fixated on ideology and orthodoxy that they can't work together. So I do think for most of us, we look at them, and we way, what plant are they from? Why can't they work together? Why can't they fix what's broken? STEPHANOPOULOS: Well they did work together here? A little overwhelming. MATTHEW DOWD, POLITICAL ANALYST, ABC NEWS: That to me is the most amazing thing. We constantly ask for bipartisanship out of this Congress and this administration. And the only way they're bipartisan is to do something for themselves. It's amazing the speed at which they did that. We have this horrible shooting where all these children die in Connecticut, we can't pass gun control legislation. But oh by the way, you're about to get delayed at the airport through some small budget cuts which I still don't understand why we make policy the way we make policy. Everybody knows there's a fiscal crisis in this country. Everybody knows we don't have the revenue to meet the expenses in this country. Somebody has to bear pain. But we act in Washington like nobody has to bear any pain. So as soon as somebody bears pain, we're going to take it back from them. That's fundamentally the problem. WILL: And George you asked the question, isn't it the case that in a showdown like this, the articulate, the well-organized, the affluent, the complaining middleclass benefits of course. Big government is always the servant of the strong enough to organize and make its levers work. The two million people who fly every day are disproportionately middle class and upper middle class. They know how to complain, they know how to organize and they know how to contact their Congressman. STEPHANOPOULOS: And the long-term unemployed are going to see their benefits checks cut. BRAZILE: By 11 percent. Those on Medicare will see their benefits reduced. And of course this is going to have a real impact on GDP and job growth. STEPHANOPOULOS: Let's talk about the broader questions about the president's agenda and the congressional agenda going forward. Especially in the wake of the Boston Marathon Bombings. There were some suggestions early on after the bombings, that perhaps Immigration Reform should be slowed down. Dan Coats on this program last week. Paul Ryan pushed back on that notion this week. REP. PAUL RYAN, R-WIS.: We have a broken immigration system. And if anything, what we see in Washington is that we have to fix and modernize our immigration system for lots of reasons. National security reasons, economic security reasons. For all those reasons we need to fix our broken immigration system. STEPHANOPOULOS: Mr. Speaker what is going on here? You've seen the Gang of Eight in the Senate build up some momentum for Comprehensive Immigration Reform. Yet in the House, you've got the Chairman of the House Judiciary Committee, Bob Goodlatte saying no, no, no I want to move with single bills that fix discrete portions of the problem. What does that mean for the legislation going forward? GINGRICH: I think the more people study the Comprehensive Bill the harder it's going to get to be. I mean this on the, remember we did this under Bush, we had the McCain-Kennedy great breakthrough. Eight hundred and some pages. Terrific press conference. And then somebody actually starts reading the 800 pages. I think you'd be vastly better off to do what Chairman Goodlatte's doing, take one piece at a time. I do think it ought to be fixed. But I think it ought to be fixed one piece at a time, out in the open, with amendments, where you actually know what it means. And I distrust deeply, 800 page bills crafted by staff and then launched with great publicity with nobody actually, none of the senators, I'll bet, has read the bill. STEPHANOPOULOS: Maybe the eight have. WILL: Eight hundred and forty-four pages to be exact. We do not do comprehensive well. Comprehensive energy plans, comprehensive health care, comprehensive immigration. It winds up like a Rubik's cube and it's almost impossible to solve or to change the analogy, it's like a Calder mobile, you jiggle something here and things start jiggling all over there. STEPHANOPOULOS: I can see the Mayor jumping out of his seat right there. I think the fear of a lot of proponents of immigration reform, is if that happens, than the pathway to citizenship will never happen. VILLARAIGOSA: Well that's right. And just, well, just last year we had every Republican candidate calling for the self-deportation of 11 million people. GINGRICH: Whoa, whoa, that's not true. VILLARAIGOSA: Let me finish. And the fact of the matter is, for a city like mine, one out of 10 people is undocumented, 400,000 of the 4 million. Forty-two percent foreign born, 57 percent of the people in my city have at least one immigrant as the head of household. But importantly 44 percent of all the new businesses that are started are started by immigrants. We need to fix this broken system. I agree, we don't do comprehensive very well, or they don't do comprehensive very well. But the fact of the matter is we're not going to have an immigration bill that doesn't have a pathway to citizenship. Even this bill says 13 years it's going to take. The vast majority of polling has said people think five years is an appropriate period of time. This is very tough on border security, it's very tough on the hurdles that you have to overcome to become a citizen. You have to pay back your taxes, you have to have a background check. If we do it piecemeal we'll have people shoot it like Swiss cheese and you'll never get a bill. STEPHANOPOULOS: I think Republican leadership lose, I'm not sure rank and file House members agree with that. DOWD: What I think though is we're going to have immigration reform. It's going to happen this year. It's not going to be slowed down. We already have a consensus on both sides of the aisle. The president wants it. The leadership in Congress wants it. It's going to happen. What the elements of it? It's going to happen this year. BRAZILE: But it's still a split between the National Republican party that would like to see immigration reform passed this year and the Congressional Republicans who want to slow it down, to look at it piece by piece. To analyze it, to see if they can pull it apart. STEPHANOPOULOS: We have two more conservative Republicans here so they're much more skeptical than Matthew Dowd is. You know, every single thing that the Mayor wants to get done, can get done in a series of specific bills. The challenge is if you have an idea so bad you have to hide it in a comprehensive bill, you know, why should we pass it? STEPHANOPOULOS: That is going to be the question going forward? Also a lot of questions about the president's leadership as he pushes all of these as well, especially after the failure, during the bombings of the background checks. It's created a whole bunch of comparisons, especially in the "New York Times" I noticed. The president, they say, is not enough like LBJ. Front page story this week. Went on and said, "If he cannot translate the support of 90 percent of the public for background checks into a victory on Capitol Hill, what can he expect to accomplish legislatively for his remaining three and a half years in office? Robert Dallek, historian and biographer of President Lyndon B. Johnson, said Mr. Obama seems 'inclined to believe that sweet reason is what you need to use with people in high office.' That contrasts with Johnson's belief that 'what you need to do is to back people up against a wall." Of course George (inaudible), if you will remember, it was mostly Democrats that Lyndon Johnson was backing up against the wall, and he had massive majorities in both the House and the Senate. WILL: Yes and he carried 44 states in the previous election and all of that stuff. The "New York Times" suffused with nostalgia for Lyndon Johnson is one of the comics of our times. WILL: But beyond that, Lyndon Johnson did understand that politics is a transactional business. You give something, you get something. This president has an inordinate faith in the power of his rhetoric. He campaigned against Scott Brown, against Chris Christy, against Bob McDonnell. He campaigned hard for the Democratic candidates in 2010 that got shellacked. He campaigned for Obamacare. It's still very unpopular. His rhetoric is overrated. It is no basis for government. BRAZILE: You know still this is a president, the first since Dwight Eisenhower to win two consecutive elections with over 51 percent of the vote. So but look Congress is broken. It's very difficult to have a relationship with members of Congress when they're worried about their next primary. And not worried about what they're going to accomplish. I think this president is trying to do the right thing in terms of outreach, putting together sensible policies. But there are no dance partners to start a relationship with. DOWD: I don't, I think the president, he's had a lot of great speeches that he's given. But I think they've made a mistake by not having a relationship, not trying to build one-on-one relationships in Congress and saying we're going to go out and talk to the country. We're not going to worry about Washington, D.C. This president has never built relationships outside of saying, I need your vote tomorrow. He hasn't (inaudible), it's all been photo ops with Congress. He hasn't reached out. He hasn't consistently said come to Camp David, sit down with me, let's talk about this. I think if the president had that ability, he's got a 1 on 10,000 ability, he does not have a 1 on 1 ability. DOWD: He's the President of the United States! VILLARAIGOSA: To get those Congressional numbers. But I think the Democrats and the Republicans, by the way, because there were a number of Democrats who didn't vote for universal background checks. They ought to be ashamed of themselves. Ninety percent of America, the vast majority of NRA members support the universal background checks. There's got to be a middle ground somewhere where we can all agree. So you put a little on the president, but I put a lot more on the Congress. STEPHANOPOULOS: Senator Mansion says he's going to come back. Mr. Speaker let me ask you about this. Of course you've been in the middle of countless negotiations in the House. Would this kind of personal politicking really make a difference on an issue when people are facing such pressure at home? GINGRICH: Sure I mean it makes a huge difference in part because you begin to learn what you can and can't do. I mean, you don't set up goals that are hopeless. And the voting pattern on gun control has been extraordinarily clear for the last 50 years. With very rare exceptions. In the end, the people who care deeply about the right to bear arms, view that as a central issue in their lives. And the people who vaguely say yes in polls don't vote on it. And what happens is I know this is a horrible idea in Washington. People actually do go home. They actually listen to the folks back home. And the folks back home say to them, don't do that. STEPHANOPOULOS: This was background checks. This was an issue that the NRA supported until the president got behind it. DOWD: In the late '90s. I'm sorry. GINGRICH: I'm just reporting, that I think if you were to go and look at somebody like Max Baucus, you would find that in Montana, the way he voted was overwhelmingly approved. DOWD: I think Congress, I think many members of Congress have bought into a myth that doesn't exist anymore. I think in some cases that's true Mr. Speaker, but I think most of what's going on in gun control, is there's not this huge vehement group of people out there saying I'm going to defeat you if you vote for background checks, I'm going to defeat you if you vote for high capacity magazines. There's not that. I live in Texas, I'm around a lot of people that shoot guns. I own five guns. There's nobody out there saying don't do that. What there is though is a group of folks in Washington that are scared of their shadow on this issue, both Democrats, some Democrats and a lot of Republicans, the myth doesn't exist anymore. But they're afraid to go launch themselves through it and do something about it. VILLARAIGOSA: What ever happened to courage and doing the right thing? Notwithstanding what the popularity polls are. WILL: What you're saying is the minority stood up against an overwhelming majority and lacked courage? I thought that was the definition of courage. Second, the gun control measures would have passed if they bore any discernible connection to preventing something that was the cause of all this argument, which was Newtown. They never connected the measures with the problem. STEPHANOPOULOS: That could be the biggest challenge going forward. We also saw all the presidents come together this week. All the living presidents come together to open up the Bush Library. It comes at a time, we had a new ABC News-Washington Post poll this week that shows since he's left office, President George W. Bush's approval rating started to climb. It's gone from 33 percent when he left office in January 2009 up to 47 percent today. It's sort of climbing back into respectable territory George Will. WILL: Well the American people want to think well of presidents and ex-presidents. The problem with the Bush legacy is the tensions within it. Arguably his greatest decision was the surge. But the surge was to correct for the disastrous implementation of the invasion of Iraq which itself never should have happened, we now know. Second, his greatest legacy are two superb Supreme Court candidates, nominees, now justices. On the other hand, one of them came after a disastrous suggestion, Harriet Miers. In Afghanistan you had an invasion he had to take, but you had terrible mission creep afterwards and we got into the business of nation building. The prescription drug entitlement, the first major entitlement he ever passed without a dedicated funding source, aggravated the coming crisis of the welfare state. And his favorite piece of legislation, "No Child Left Behind" offended every conservative instinct by nationalizing, further nationalizing a quintessential state and local responsibility. STEPHANOPOULOS: Matthew Dowd you worked for the president for several years. Broke over the Iraq War. DOWD: Well yeah and I was there for the first five years of the administration, as you say, broke over the Iraq War. I think it was a great moment. These are always great moments that happen, the five living presidents there. They pay respects regardless of party. The libraries and presidential institutions are an important part of our cultural and research and conversation. And I think the president, reflecting back, had done a number of good things. What he did for aid to Africa. As Donna has pointed out, what he did in the aftermath of Katrina, and a number of things. And I think what you saw, everybody thinks that this is a good man. But the problem that I saw in this whole thing as we had that day and everybody focused on it, it's as if you were asking the people who got off the Titanic, they say, other than that, how was the trip? And the Iraq War was a disaster. We spent over $1 trillion. We lost thousands of lives. I had a son that served there. We lost thousands of U.S. lives, thousands of lives over in Iraq. And the Iraq War for at least 20 years is going to affect us. It's already affecting our foreign policy in Syria. It's caused the president to not say, well I don't know if I can do this because of what happened in the Iraq War. It's affected our domestic policy because the lack of funds, the lack of ability. And it polarized the country. And so I think we pause for a moment and say, yes he's a good man. But in the end, the Iraq War was such a disastrous decision, it affected this country so dramatically. His tie to history is going to be completely tied to that. GINGRICH: I think the thing you saw for a brief moment there with his father captured the heart of George W. Bush. This is a person who tried very hard to do what he felt was right. Has an enormous sense of decency. And I think as he said in his closing thing that you had on the show, he really loves America. I agree with the critique and I think people are going to be pretty tough about the record. But I don't think they're going to be very tough about the man. I think there's a real difference in those two. STEPHANOPOULOS: That was clear. You saw that all day on Thursday. BRAZILE: You know he got off the stage in 2009 and said, you know, good bye, so long, I'm not going to inject myself into the day-to-day politics of the policy, of the country. I think that was for the good. Not just of his legacy but also something maybe future presidents should do. Let the other one govern. STEPHANOPOULOS: And you see him sticking to that. In all of the interviews this week, would not touch a policy issue. VILLARAIGOSA: You've got to respect him for that. I actually did like to see for once Democrat and Republicans together acknowledge the man and not just his policies. I'm with you Matt. I think his biggest mistake was getting into that war. And I didn't vote for him either time. But you have to respect the presidency. I do. I think it's important for us, and in a democracy. And I thought it was a good moment, a respite from the kind of the partisanship you see here that gets you sick. STEPHANOPOULOS: We're going to take a quick break. Coming up behind the scenes at last night's bash. Back with our snapshot, strange encounters and the best standup. CONAN O'BRIEN: Turner Broadcasting is going to make a major television miniseries, Vice President Joe Biden is going to be played by Bob Barker. Representative Paul Ryan will be played by Mr. Bean. Secretary of State John Kerry will be played by an Easter Island head. (FEMALE): George is back with more "This Week" after this. STEPHANOPOULOS: Stick around for our take on the shtick from the President, Conan last night. But first we've come up with a new way to experience live events online. It's called Social Soundtracker. We launched it last night at the Correspondent's Dinner. You can vote for your favorite or least favorite moments with just one click. Last night the Soundtracker said Tracy Morgan had the best joke. TRACY MORGAN: He makes everyone better. Without them, I never could have played Joe Biden, literally, I am Joe Biden. STEPHANOPOULOS: Learn more about Social Soundtracker by going to ABCNews.com and we'll be right back. O'BRIEN: The President and I are a lot alike. We both went to Harvard, we both have two children, and we both told Joe Biden we didn't have extra tickets for tonight's event. PRESIDENT BARACK OBAMA: My charm offensive has helped me learn some interesting things about what's going on in Congress. It turns out absolutely nothing. O'BRIEN: Some in this room have even accused the president of being distant and aloof. When I asked the president about it earlier, he said, oh and then walked away. OBAMA: Some folks still don't think I spend enough time with Congress. Why don't you get a drink with Mitch McConnell they ask? Really? Why don't you get a drink with Mitch McConnell? STEPHANOPOULOS: He might have been talking to you there, Matthew Dowd. The point you were just making. One of the things, we've now seen the president do this several times. He loves taking out that shiv especially against the press. DOWD: His timing is impeccable and the way he did it about himself. He is a comedic genius in a way, how his timing works. That evening event was wonderful. You have Hollywood mixed with the business community mixed with politics mixed with Washington. It's a great moment. I know everybody sort of says wow what are they doing? There's serious problems. It's a great light moment that everybody sort of can take advantage of. And I thought the president did a great job. VILLARAIGOSA: (inaudible) over the last eight years, seven years or whatever. Five years. He just was phenomenal, the timing was perfect as you said. Now we know what his next job will be. STEPHANOPOULOS: You've been to this a couple times right? STEPHANOPOULOS: And what did you think of last night? GINGRICH: Well look the good news, the Mayor just said, it may have been his best moment. The bad news for the president is you'd like sometime in five years to have a better moment than the Washington, the White House Correspondent's Dinner. But he was very good last night. STEPHANOPOULOS: And George we are getting, we saw Tom Brokaw come out of last year's dinner and say, this shows everything that is wrong with Washington. The president, the press actually cozying up a little too much. He says it's gotten way out of control. WILL: That's far down on the list of what's wrong with Washington. I've never been to one of these things. WILL: It occurs during night games and I'm not going to miss those. Second, I'm such an ignoramus about popular culture, I don't know who I'm supposed to be excited to see. And third, it's a classic Washington moment, where two people talking to one another, each looking over the shoulder to see if there's someone more famous they should be talking to. BRAZILE: It's a great networking event. I've been to over 25 of them. I chose not to go last night because I thought it was important for some of the young people who've been covering Boston to get a chance. But I did go to all the pre-parties and I'm happy to report that I have in addition to, thanks to People magazine, I have a twist band, I have some tea, we can share that George. And some happy socks. STEPHANOPOULOS: Thank you all very much, great show today. And now we honor or fellow Americans who serve and sacrifice. This week the Pentagon released the names of three soldiers killed in Afghanistan. That's all for us today. Thanks for sharing part of your Sunday with us. Check out World News with David Muir tonight and don't miss Diane's Sawyer's prime time special Tuesday night, the first interview with Amanda Knox about her harrowing experience in Italy. I'll see you tomorrow on GMA.